My husband and I spent the weekend and got this far on the first hive. The observation window turned out to be quite the challenge and the whole thing looks over-engineered, but it stand quite sturdily! Still need to add the roof and make all the bars. The eco-floor has a solid bottom...I just saw some pics that showed an open mesh floor on the bottom -- is the eco-floor closed or open? (will eventually post the whole build at http://honeydome32669.blogspot.com/). 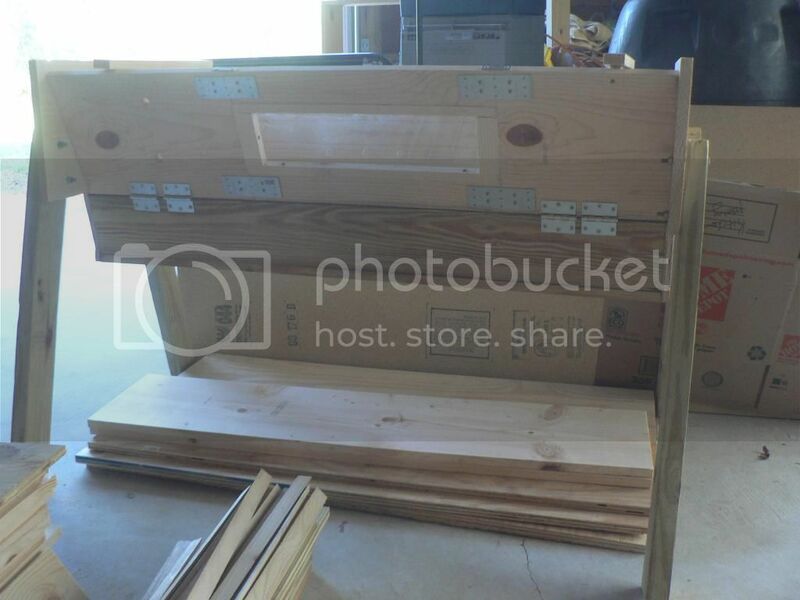 Posted: Sun Mar 23, 2014 10:58 pm Post subject: Very nearly finished! 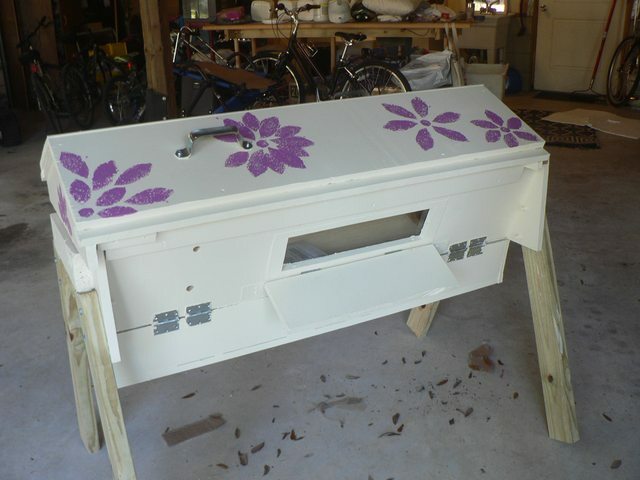 I will eventually write out the whole saga, but for now, the first hive has gone from its unpainted terminator look to the overly-bland pale yellow to the very-nearly-finished state that includes orchid-colored flowers (the Valspar color of the year!). The only step to complete is adding a latch for the observation window. 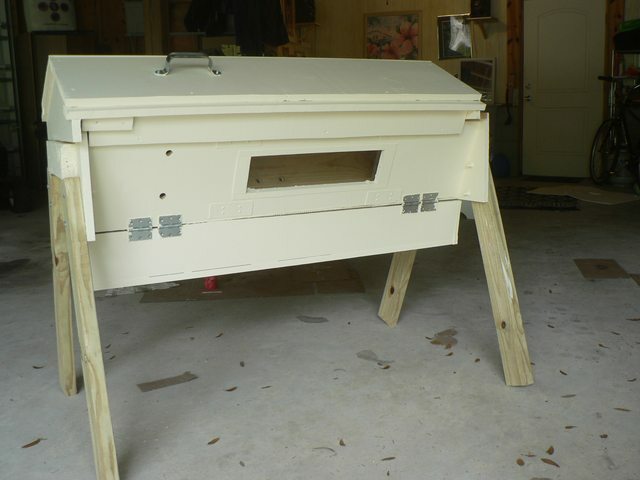 The bees should arrive in 3 weeks or so, and I'll put the hive out into the bee yard next weekend, complete with the "welcome home" items from Goldstar Bees (old comb, lemon grass oil). Splendid job - best-looking hive I have seen for some time! 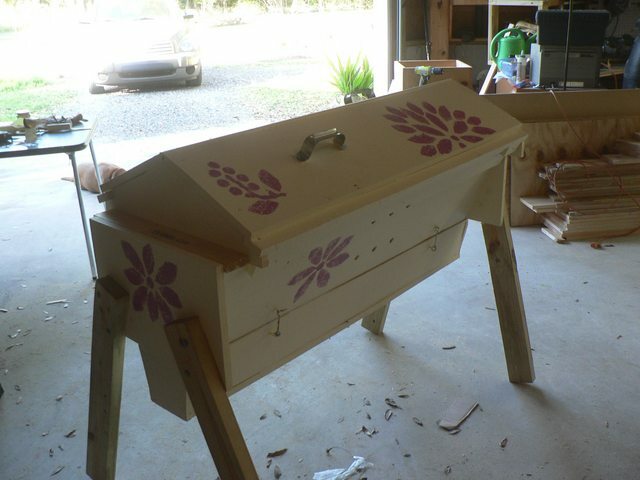 Prettiest looking bee home I have seen in a good while. Over-engineered? Lets just say it is solid and should give many seasons of trouble free use. Hope the girls appreciate the effort put into building their new lodgings. Thank you! I hope the hive lasts a while -- our first venture took a good 20 hours to complete, and the bars are not as even as they need to be. Of all the components, those are hardest to build without higher-end machinery (we were using a circular saw). I am considering buying them the next time around! We are building more hives this spring too and in discussing how many hives to build, the question has come down to how many top bars do we have the patience to saw up. (Circular saw here too). It is tricky work getting them the right width, and I like to have plenty of spare shims too, to widen the honey bars and have the bars fitting tightly when I close the hive. B Kind, we chose the pre-sized route for bars -- we made 1/2 at 1.25" for brood and half at 1.5" for honey/drone, etc. If the 1.25" turns out to be too small, then I'll have to add spacers. The lack of regularity is something I'm worried about -- there a handful of bars that leave real gaps, and I'm thinking I'll have to use some kind of light cover over the bars to keep bees from migrating into the roof area (and hope that doesn't mess with insulation). I also needed to add a "spacer bar" -- this goes after the follower board b/c even when all 30 bars are on the hive, there is this 2" gap at the end! Sigh. Didn't help that I made the newb mistake of re-designing certain features before I'd even built my first one . On the other hand, I got my husband a miter saw for Christmas and we used that to do some final trimming on the bars, and it was so fun and easy that I think talking him into a real table saw will not be too hard!! If you are having problems with bar width and straightness from using a hand held circular saw, try ripping the bars slightly oversize and use a hand plane to both straighten the cut edge and ease the bar down to the desired width. Some types of timber can "move" after being ripped down to narrower boards. In effect, by cutting thinner boards from larger widths, you relieve stresses in the timbers grain and it can cause the thinner boards to bend within their length. Another good reason to rip oversized- allow the boards a day or two to "rest" (assume their bent profile) and then plane back to straight. Hand held circular saws usually come with a ripping guide- but unless you are quite familiar with the use of the guide and indeed the tool, it can be quite a challenge to rip perfectly straight lines. A cheap but sharp hand plane then becomes your best friend. If you have bars that are not meeting well together now, I suggest planing them straight and gluing a fillet of timber on the edge to regain the proper width. So the bars sit well together before you add the bees. 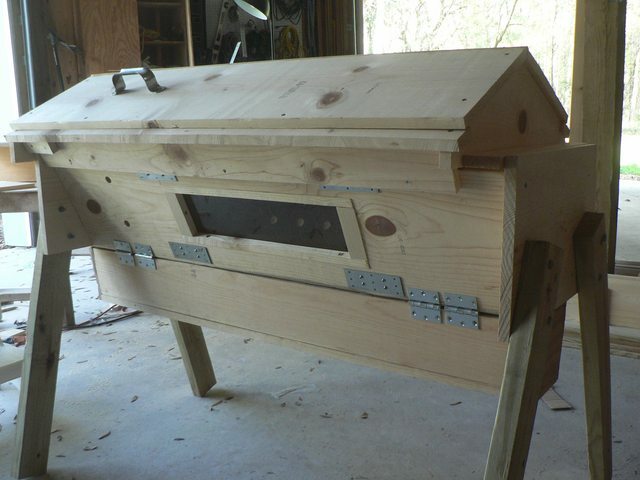 That way you will have no problems with bees "exploring" the roof space, or having trouble temperature regulating the hive internals because of excessive air gaps/air flow. Thank you, J Smith. I will fill them in to straighten bars out. Don't know why I didn't think of that!